Redsn0w 0.9.8b1 was just released to jailbreak iOS 5 beta 1 on the following hardware: iPod touch 3G, iPod touch 4G, iPad 1, iPhone 3GS, iPhone 4 GSM, iPhone 4 CDMA. This jailbreak is tethered, meaning you will need to connect it to your computer on each reboot. If you are comfortable with all of these limitations, proceed. The iPhone Dev Team suggests this version of redsn0w will continue to work to jailbreak upcoming iOS 5 betas assuming you save your b1 IPSW and point it at that file when jailbreaking, so they recommend preserving your 5b1 IPSW files for future use. If you’re brave and don’t mind losing some essential features of your phone, you can install iOS 5 beta on an iPhone without a dev account or UDID activation by utilizing a bug in Voice Over, but this is not a recommended method, and there is no word on compatibility with this version of redsn0w. I see no reason to JB anymore. iOS 5 matches the features I used to jailbreak for (notifications on lock screen) and tethering through MyWi is no longer an option. I know this won’t be popular to say but I think jailbreaking is dead. je pense pas et je suis pratiquement sur qui il y aura toujours la possibilité de jailbreaik débloquer son téléphone iPhone toutes catégories pour la simple raison que si le jailbreaik disparaissait et il y aura une baisse de l’achat du iPhone puisque c’est l’un des points forts de l’achat du iPhone par les utilisateurs en tout cas pour moi c’est ce qu’il fait que j’ai toujours acheté le téléphone. si cydia disparaîtraient je ne verrai pas l’utilisation qui pourrait motiver l’achat du iPhone en Europe plus que beaucoup d’application coûterait trop chers et surtout que l’utilité du iPhone n’a pas les désavantages qu’on les américain. I don’t think JB is completely dead. Apple still can’t manage something like SBSettings which is the biggest reason to JB for me and lots of people. 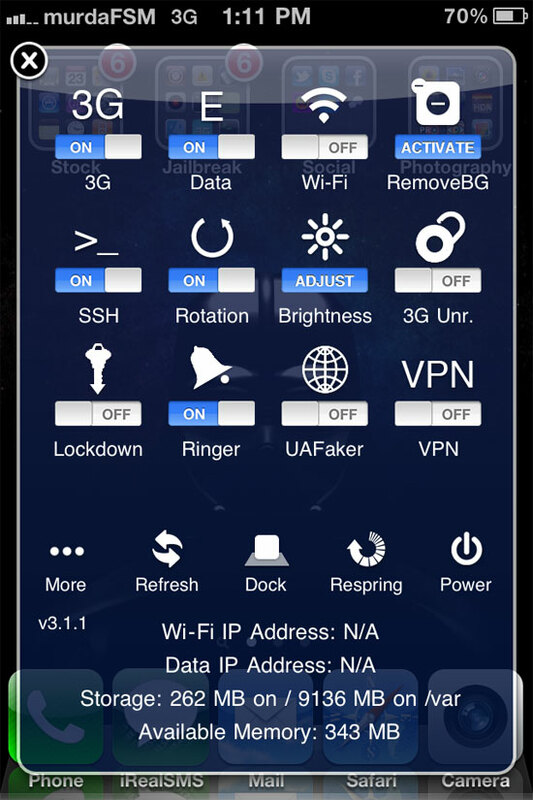 What is SBSettings? I hear about it but I don’t understand why I would want it. SBSettings stands for Springboard Settings, it just lets you access settings from anywhere in a quick format. Has stuff like processes, IP address, memory, storage capacity. It’s cool but certainly not worth a tethered jailbreak in a buggy beta OS for. soon will be a version for Windows!